FOSTER CITY, Calif. – March. 29, 2017 – Conviva, powering every internet-connected screen with the most engaging viewing experiences imaginable, and castLabs, a global partner in premium digital video technology, today announced deep product integrations at both the video player level and for Quality of Experience (QoE) measurement. With the explosive growth of OTT viewing and consumer interest, more and more publishers are looking for turnkey, end-to-end solutions to deliver high quality and consistent streaming video experiences. Today’s announcement brings together the video player and QoE measurement part of that equation in two important ways. 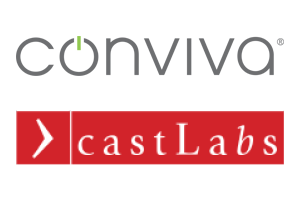 First, castLabs and Conviva have worked to integrate and validate castLabs’ PRESTOplay video player frameworks with Conviva’s SDK, measuring every viewer’s quality of experience in the player. This saves valuable time for both the publisher and the branded application developer, and ensures a high quality, error-free integration. It is also optimized to ensure no degradation in software quality nor response times. castLabs’ customers in essence have a turnkey, pre-integrated QoE solution with Conviva. Furthermore, existing Conviva customers now have a hassle-free new player option to choose from when they are looking to change or expand to new video players. Additionally, as a partner for Conviva’s QoE Ecosystem initiative, video experience service statistics will be provisioned for castLabs to enable efficient and effective response to the possibility of player related viewing experience issues. The unified service statistics dashboard and shared customer visibility will allow castLabs to avoid problems before they have a chance to impact consumer experience. Conviva’s multi-screen QoE metrics provide transparency for castLabs and all other constituents in a publisher’s video delivery ecosystem. Conviva’s metrics are the standard by which performance can be evaluated and measured, and solutions such as these are helping the entire OTT video delivery ecosystem move closer to providing a best-in-class quality of experience for consumers. To discuss this integrated solution further, Conviva and castLabs will be exhibiting and available for meetings at both TV Connect in London, England between 28th-30th March, and NAB Show in Las Vegas between April 24th-27th.